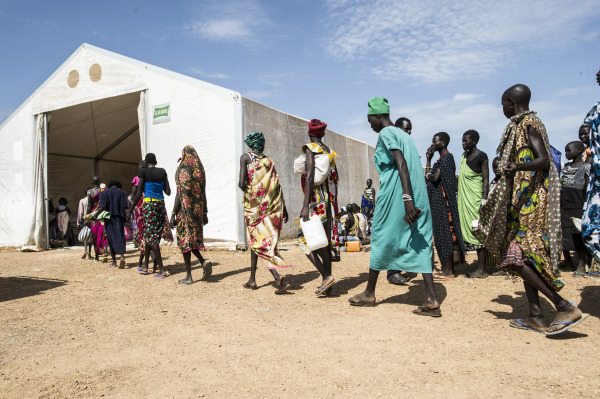 Displaced Persons in Minkammen, South Sudan queue at a food distribution center (UN photo library/Isaac Billy). The list you can read here is the work of a small group of civil society volunteers who have been collecting data to gather together the names of all those who have died in South Sudan since 15th December 2013. Family and friends of those who have died in the conflict have willingly provided the majority of the information through a testimonial form developed for this project. Additional names of victims were collected through news articles, public websites, community lists, social media and human rights reports that named victims of armed conflict across South Sudan. Each name is backed up with additional data, which was collected as a means of verification. Only the NAME, AGE, DATE AND LOCATION OF DEATH are available in the list. All possible efforts were made to ensure that the names are real and that the deaths have been confirmed. Only through receiving information, submitting names or having names in the public domain were the names added to the list. The list is not exhaustive and includes 568 names of victim from the start of the conflict on 15th December 2013 to 31st October 2014. It includes men, women, elderly people and children, South Sudanese people of different ethnic groups and people of different nationalities. The oldest victim is a woman of 105 years old and the youngest is a 14-month old baby. The list contains people of different professions – both civilian and military. Those killed are traditional chiefs, doctors, engineers, housewives, pastoralists, nurses, religious leaders, students, farmers, traders, men in uniform, including UN peacekeepers, but the majority of the victims on the list are civilians and young people, demonstrating that South Sudan has lost so much of its human capacity and potential. This list, although a fraction of the total loss, reflects the devastating human impact of South Sudan’s year-long war in which no one has been officially counting the dead. Peace remains elusive, mass graves dot the landscape with civilians, both young and old, bearing the brunt of the fighting. At the time of writing, people are continuing to die. Under Article 4.2 of the Cessation of Hostilities Agreement, signed by the two warring parties on 23 January 2014, “˜The parties agree to an enabling environment to facilitate the decent burials of the dead and memorialization, support reunion of families and any such act that promote human dignity.’ We accordingly call on all parties to the conflict and citizens to take all possible measures to identify the dead, maintain detailed records and, as far as is possible, ensure that the dead receive dignified burials such that the information can eventually be made available to their loved ones. This publication coincided with several national commemorative events taking place on the 15th December 2014. Religious groups, South Sudanese people and their friends around the country and in neighbouring countries took a moment to pause and acknowledge the dead, including both those named here and those whose names are not yet publicly known. In Juba, South Sudan, the names were read aloud by some of the friends and relatives of the dead. The readers represented all of South Sudan’s regions. The names and this statement were also be displayed at many of the commemoration events. In Nairobi, Kenya the list was read aloud by family and friends of the dead at an event organized by Amnesty International and several other organisations. These commemorations spoke of the strength and resilience of the affected communities and the lights that have shone in solidarity as South Sudanese people have supported and helped one another during this painful year. The commemoration in Juba was a small event, dwarfed by the tragic loss of life, but it was a start. As time continues to pass, the list of names will inevitably grow into a true reflection of the colossal loss of life that the people of South Sudan have once again suffered. It is hoped that one day all the dead of South Sudan’s conflicts will be formally and publicly recognized and remembered as part of a national memorial of commemoration. Those who wish to add their own loved ones to this list may do so by emailing to request a “˜Naming the Ones We Have Lost’ form: namingtheoneslost@gmail.com. We are exploring more ways in which you can submit your names and will publish this information when it becomes available.